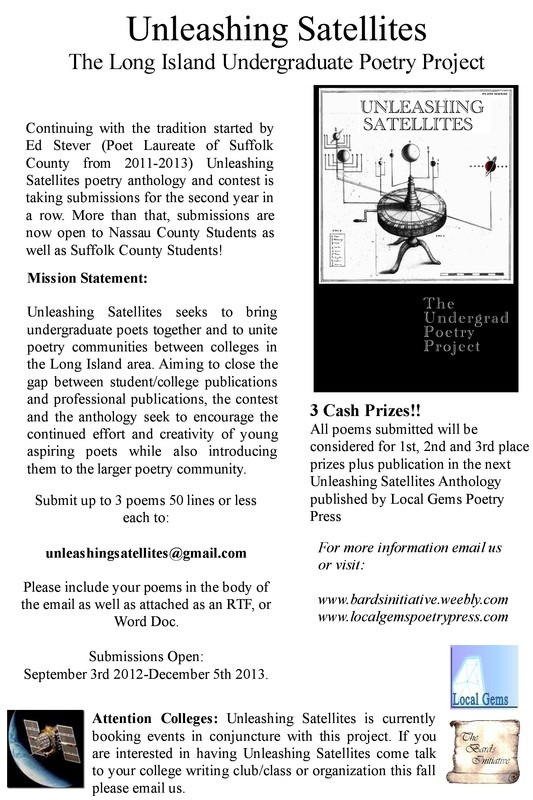 Continuing with the tradition started by Ed Stever (Poet Laureate of Suffolk County from 2011-2013) Unleashing Satellites poetry anthology and contest is taking submissions for the second year in a row. More than that, submissions are now open to Nassau County Students as well as Suffolk County Students! All Contributors Get A Free Copy of The Finished Book. All poems submitted will be considered for 1st, 2nd and 3rd place prizes plus publication in the next Unleashing Satellites Anthology published by Local Gems Poetry Press. Please include your poems in the body of the email as well as attached as an RTF, or Word Doc. September 3rd 2012-December 5th 2013. Unleashing Satellites is currently booking events in conjuncture with this project. If you are interested in having Unleashing Satellites come talk to your college writing club/class or organization this fall please email us.